Currently: Senior Exhibitions Producer at THE SHED. Assisting with all phases of the development of exhibitions, from proposal phase, to production, installation, maintenance and deinstallation. Coordinating shipping, receiving, and movement of artwork onsite. Working closely with artists, fabricators, and vendors to manage the production of art works prior to exhibition, and onsite, as needed. Current projects include: “Reich Richter Pärt” - a Collaboration with Steve Reich, Gerhard Richter, & Arvo Pärt. “Trisha Donnelly” - a Commission of new works by Trisha Donnelly. “Agnes Denes” - a retrospective and major new works. “Open Call” - large-scale commission of underexposed NYC artists, in all disciplines. Fabrication & installation management, as well as performance production coordination by Art Domantay. MoMA PS1 VW Dome Theater (2015-2018) Rebuilt & customized annually to house live programming during winter months. The 70-foot-tall reusable structure is outfitted with strong floors, AV infrastructure, tech-booth, ADA accessible decking and energy-saving vestibules for 3 entrances, as well as a protective shed for the massive portable AC-units, all have to be re-fitted or built from scratch. It takes approximately 20 days to complete the installation, and a week to strike. Project management & installation by Art Domantay. 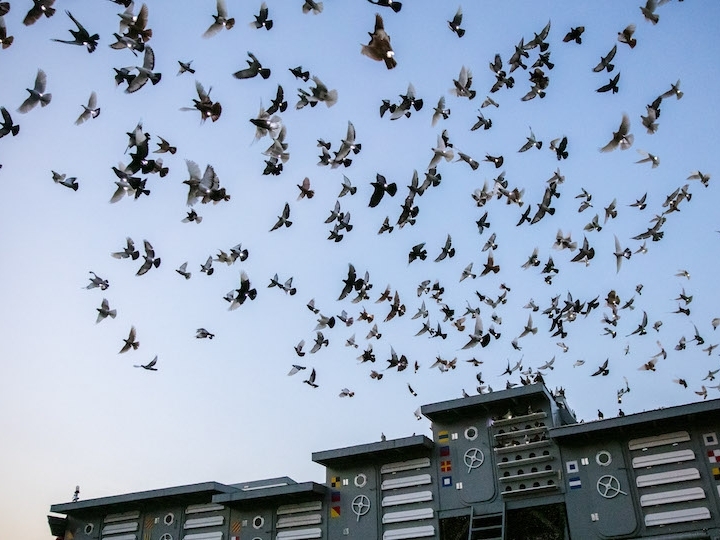 Duke Riley’s “Fly By Night” (2016) is an homage to pigeon keeping, presented at the Brooklyn Navy Yard, flew two thousand birds nightly, wearing LED ankle bracelets, as part of a massive custom pigeon coup built atop a helicopter aircraft-carrier. Co-led with Aaron Suggs. Presented in 2016 by Creative Time. Fabrication & installation management by Art Domantay. “Hy-Fi” (2014) Designed by The Living. 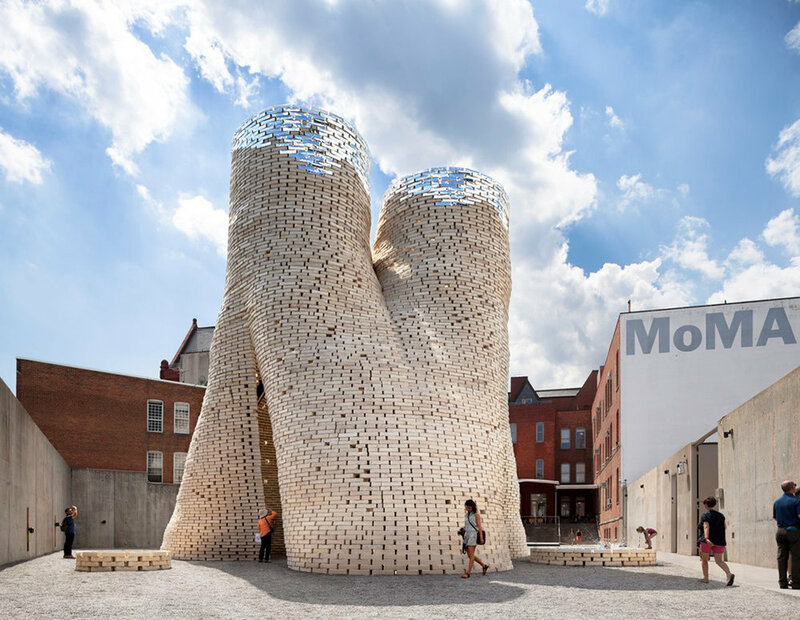 40-foot-tall temporary architectural structure made with 10,000 building-grade bricks “grown” with mushroom roots and hay. Built for the Young Architects Program. Led 40 volunteers, 8 carpenters, 6 masons. Tested and refined a new low-energy biological building material, manufactured 10,000 compostable bricks, constructed a 13-meter-tall tower, hosted public cultural events for three months, disassembled the structure, composted the bricks, and returned the resulting soil to local community gardens. This successful experiment offers many possibilities for future construction. Presented in 2014 by MoMA PS1 for The Young Architects Program. “Public Farm 1” (2008) Designed by WORK Architecture Company for MoMA PS1's Young Architects Program. Managed 24 carpenters and over 30-plus volunteers, to build a functioning urban farm out of recycled materials, that climbed like steps up and over the concrete walls of PS1’s outdoor galleries. Project Managed fabrication and installation. Yayoi Kusama's Narcissus Garden, an installation of floating mirrored balls in the Conservatory Water, connects back to her notorious Narcissus Garden for the 1966 Venice Biennale when the artist was censured for selling 1,500 mirrored globes under a sign that read "Your Narcissism for Sale." 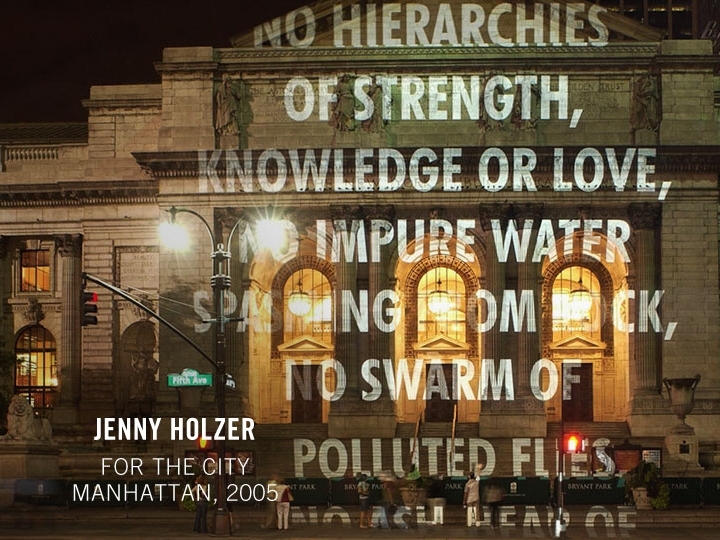 Presented in 2004 by Public Art Fund in collaboration with the Whitney Museum. Paul Ramirez Jonas’ “Key to the City” reinvented the civic ornamental honor as a master key able to unlock more than 20 sites across New York City’s five boroughs and invited the people of the city to exchange keys in small bestowal ceremonies. Matting & Framing Consultant, Conservation Assistant II, Department of Paper Conservation, 1997 – 2000. Photograph Conservation Assistant, Department of Photographs, 1995 – 1997. Oversaw collection of over 226,000 objects, Mat & frame 600+ works of art on paper per year for exhibition, loan, and storage. Installation of rotating photographs, old master drawings, and illuminated manuscripts. Work closely with conservators on techniques and curators on exhibition materials. Responsible for annual budget of tools & supplies. Routine domestic and international courier of artwork to: The Metropolitan Museum of Art, Museum of Modern Art, New York, Whitney Museum, Dayton Art Institute, Harvard University, San Francisco Modern Museum of Art, Detroit Art Institute, National Gallery Sydney, Australia and the Andy Warhol Museum in Pittsburgh. Co-supervise transition of Getty’s photograph collection from Santa Monica to new Getty Museum. Initial order of all machines, tools, and conservation supplies for new museum’s photo conservation workshop. Re-house over 2,300 daguerreotypes designing customized sheets. Utilize specialized computer software for mapping each daguerreotype in solander box. Re-house 500+ photo album collection, rare books, and unmated photos. Four community-based art commissions by Xenobia Bailey, Simone Leigh, Otabenga Jones & Associates, & Bradford Young. “Living as Form” documented over 100 artists' projects in a large-scale survey exhibition inside the historic Essex Street Market building in Manhattan. “PLOT09: This World and Nearer Ones” () First edition of public art quadrennial on Governors Island, featuring 19 artworks by international contemporary artists. “Democracy in America / Convergence Center At Park Avenue Armory” Works by over 40 artists filling the historic rooms of the Park Avenue Armory. 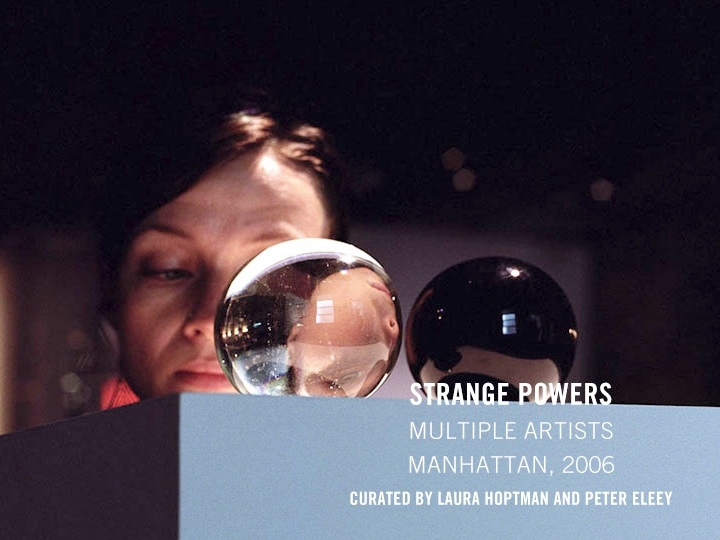 “Strange Powers” Twenty internationally acclaimed artists explored the transformative power of art through magically charged manifestations. Curated by Laura Hoptman and Peter Eleey, & presented on the second floor of an East Village building, rumored to be haunted. 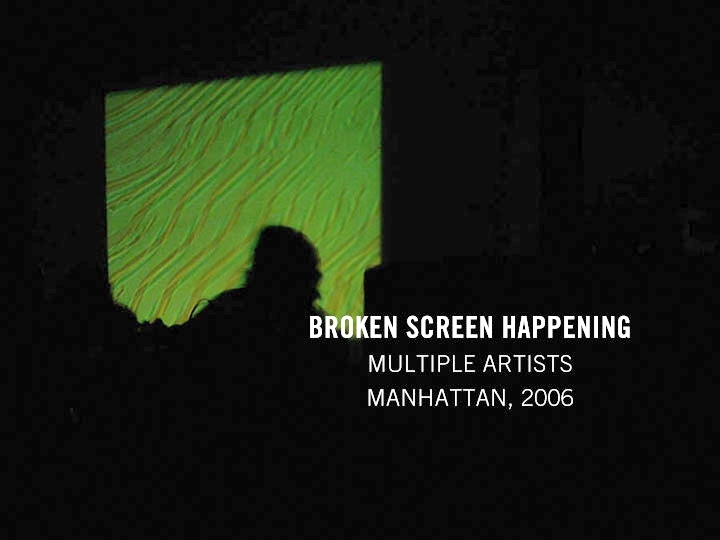 “Broken Screen Happening” Essex Street Market, Informal conversations between Doug Aitken and a roster of twenty-five carefully chosen filmmakers, designers, architects, and artists. “The Plain Of Heaven” (2005) Curated by Peter Eleey, Inspired by the redevelopment of the High Line. Mounted in a vacant meatpacking warehouse at the southern end of the Line, the exhibition explored numerous themes relating to the ways in which we imagine both inaccessible spaces, as well as those in transition.